The sun is still shining and the great bands just keep on coming! Check out what we made of Megadeth, Deftones, 30 Seconds To Mars, Skin and Rage Against The Machine. 17:45 - This year Donington is marking the 30th birthday of Monsters of Rock, thrash is 25 years old and Megadeth are having an anniversary party of their own. 20 years on from its release, the band are rattling through classic headbangers from their Rust In Peace album, and it sounds just as good today as it did back when it first dropped. Shawn Drover dominates from the back of the stage. He may not bust out the lightning fast kick work seen earlier this weekend, but he's as solid as a rock and heavy as hell. 19:00 - Another band bang on top form is Deftones. Abe Cunningham and the boys launch into an absolutely blistering set that contains just about every track you could possibly wish to hear. 19:20 - 'Be Quiet and Drive' and 'My Own Summer' help keep Donington's excitement levels at fever pitch, while Abe shows just why he's so revered by so many up-and-coming metal drummers. An incredible set by an incredible band. 20:20 - A quick dash to the catchily named Pepsi Max Stage sees us get settled just in time to see the tail end of classic rocker's Skin's party rock set. 'Look But Don't Touch' proves to be a real singalong anthem, just what was needed inbetween what's sure to be two pretty intense Main Stage sets from Deftones and Rage Against The Machine. 20:45 - But before Rage we made another quick run over the Rio James Dio Stage to check out 30 Seconds To Mars.Shannon Leto and co were on top form throughout their killer Ronnie James Dio Stage headlining set, but for us the highlight has to be Chino Moreno guesting on 'The Kill' Oh, and 'Kings and Queens' was pretty damn sweet as well! 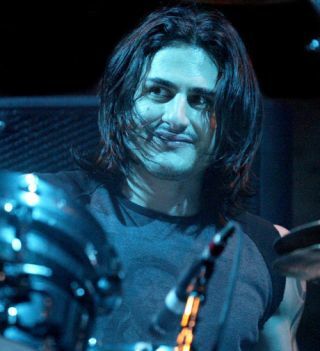 21:15 - Then it's time for Brad Wilk and co. 'Testify' kicks things off, and it's truly awesome. We're now completely gutted we missed out on tickets to their Finsbury Park show last weekend. 21:30 - The classics keep on coming as Rage blast through 'Bulls On Parade', 'Bombtrack', 'People Of The Sun' and a whole load more. Not even a brief mid-song pause to ask the crowd to look after each other and take a couple of steps back can interrupt Rage's flow, as they launch straight back in with ease. 21:45 - 'Know Your Enemy' kicks off with a warning from Zack de la Rocha on the evils that Simon Cowell and co stand for, which is met with a huge cheer. 22:30 - But that's nothing compared to the ovation that comes as Brad and co end their set with 'Killing In The Name'. Donington becomes one huge dancefloor as 100,000 festival-goers lose their minds! 22:40 - No fireworks tonight, but we truly saw a band on fire in Rage, the set of the weekend so far, perhaps?